Good evening, space fans! Here's all the latest from our neighbors in orbit. The Dragon, draggin' things home. This week, the SpaceX Dragon capsule that arrived on April 17th was sent back down dirt-side, bearing 3,100 lbs. of research equipment and completed scientific experiments. It splashed down in the Pacific Ocean, about 155 miles southwest of Long Beach, California, and was recovered without incident. The Dragon, on approach to the ISS in April. 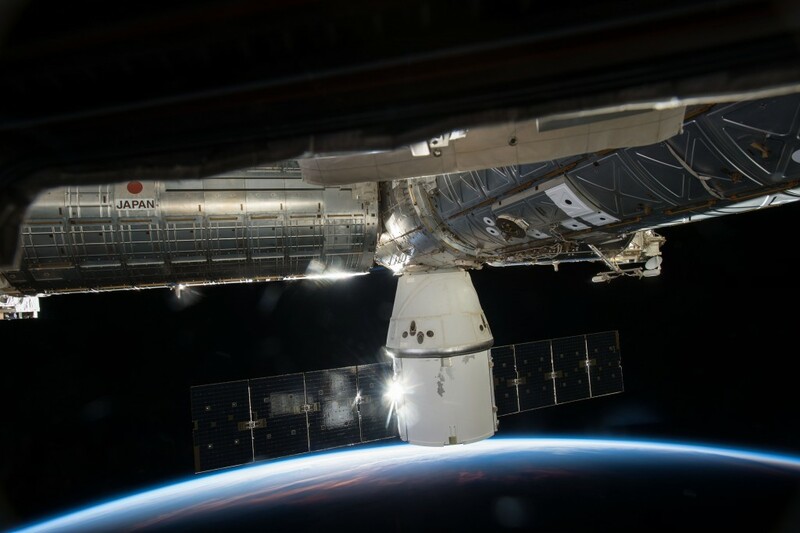 On June 26th, the SpaceX Dragon will make its seventh cargo delivery to the ISS. Among other important cargo, it will carry up two International Docking Adapters. These adapters are critical for readying the station for the new commercial spacecraft that will be visiting in the coming years. Cosmonaut Mikhail Kornienko, the Russian member of the famous "One Year Crew" duo (also comprised of NASA astronaut Scott Kelly) continued research as usual, gathering data for the Fluid Shifts investigation. The study is to help determine how intracranial pressure can affect eyesight and other elements of perception in micro-gravity. Scott Kelly took a great photo of the island of Manhattan, possibly in celebration for New York City's Fleet Week. And the Thunderbird pilots who buzzed up the Hudson River on Friday thought they were so cool! Other interesting scientific endeavors that returned home aboard the Dragon included the astronauts' work on the Space Aging study, which monitors roundworms throughout their growth cycle to determine how growing older in orbit can affect various systems in the body. The roundworms are small stand-ins to determine the possible effects that long-duration spaceflight can have on the human body. Data from the SpinSat, a 22-inch satellite deployed from the ISS, was also returned aboard the Dragon. The SpinSat uses new thruster technology to regulate its position, and its purpose is to study the thermosphere. One of the upper layers of the atmosphere, the thermosphere is an important element to monitor and research to allow for better maneuverability of satellites and more thorough connection with telecommunications elements in orbit. That's all for this week, space fans! Check us out next Sunday for more spectacular science...watch this space! The Dragon rides past the fire of the sun, headed homeward.